Over time, inlays come and inlays go. Some like the "Mucha Lady" and "Tambourine Girl" have been admired and found their stay for decades. Then you have inlays such as "Robin Hood". Who once adorned Presentation headstocks throughout the late 70's to late 80's, captivating the admiration and imagination of many owners of it's time. For our 49th year, and after several decades on hiatus, Robin Hood returns to grace our custom inlaid headstocks once again. Have a look at this incredible C-10 "Robin Hood" Custom that will surely contribute to any already existing Guitar Acquisition Syndrome you may be experiencing! For more Larrivée customs and further G.A.S., have a look in our Custom Archive section. The revolutionary new 40 Series features our innovative "Scalloped Parabolic Hybrid" bracing system design. Based on our "X-Brace" design, Jean has blended it with a non-symmetrical scalloped lateral cross-bracing pattern. This means maximum strength using the least amount of material. It's a build that allows even further vibration of the soundboard, while still offering a controlled bass response. Some call it the low end "growl". The 40 Series are built in America using all solid wood and feature detailed upgrades like bone bridge pins, bone nut and saddle, diamond fingerboard dots and Grover 18:1 open back tuners. Jean's exciting new design means a fresh new sound that is sure to appeal to traditional and long-time Larrivée players alike. Available in Dreadnought, OM, 000, 00, and 0 body styles. Mahogany and Rosewood are standard. Custom exotic woods are available upon request. Premier Guitar Magazine review. NOW AVAILABLE for custom order and through Larrivée Authentic store! 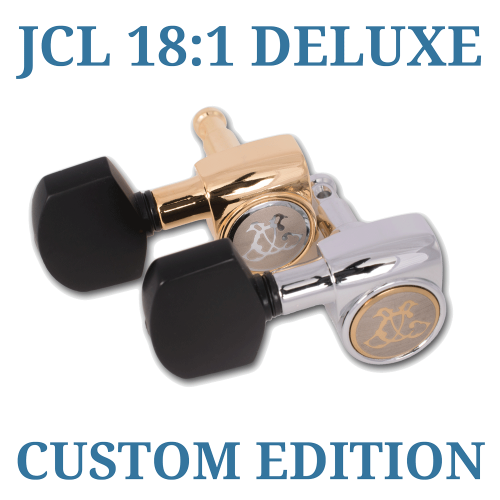 Available in chrome and gold, these slick new 18:1 JCL's feature our long awaited black aluminum buttons. They are easily dropped in and swapped out with our standard Larrivée tuners, as well as current JCL's. Custom Edition JCL chrome with black aluminum buttons will offered as a custom upgrade for $89. Gold with black aluminum buttons will be $99 with matching gold end pin. Mini's for Parlor and 12 Strings are also available. For custom upgrades to your guitar, please contact your dealer. For purchase of machine heads direct, please see our "Larrivee Authentic" online store. 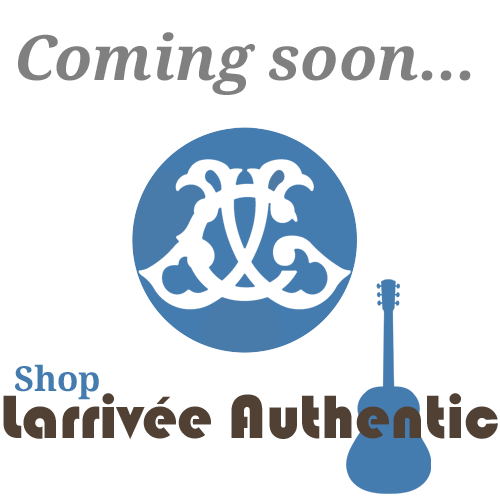 SHOP ONLINE WITH LARRIVÉE AUTHENTIC! Find everything from cool new wearables, to accessories, upgrades and replacement parts. Everything you need and more. Paying will be made easy with PayPal and major credit cards. A $10 flat rate shipping fee inside the USA is waved for orders over $100. P-01 ISS REISSUE's HAVE SHIPPED! *For further assistance locating a dealer near you, see our dealer locator section in "Where To Buy" or contact us directly. P-01 REISSUE SHIPPING TO DEALERS NOW! OCT 9, 2015 Warner Music releases Commander Chris Hadfield's album Songs From a Tin Can— the first album ever recorded in space. It’s an out-of-this-world partnership we’re especially proud of. 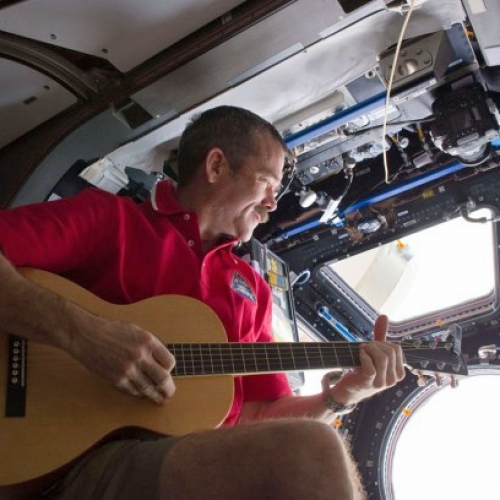 A talented musician, Commander Chris Hadfield played it frequently, and used to it record a version of David Bowie’s Space Oddity - the first ever music video shot in space, seen by millions around the world. He also used the P-01 to lay down the initial tracks for his new record, Songs From A Tin Can. Watch the premier track video for the album "FEET UP". The new limited D-40 Black Walnut Series has started shipping. What do you get when you combine our exciting new 40 Series bracing pattern with the sonic properties of a tight, punchy Walnut? A case of some serious GAS. There is no argument that Jean Larrivée sources out some of the most spectacular tonewoods in the world and this walnut is no exception. Featuring a Sitka Spruce glossy top and a hand signed label, this model is a show stopper all around. The D40W Limited Series is shipping now so check with your dealer today. Custom orders are still being taking while limited supplies last. The retail price has been set at $2099 MSRP and is also available with pickup. 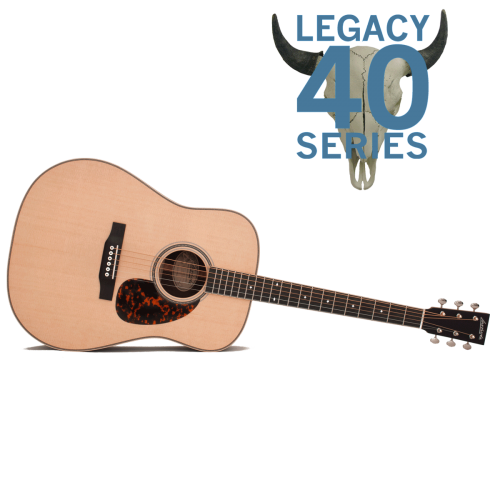 For more information on specs and hardware go to our D-40W showcase page. For other editions available please check out our Limited & Custom section and have yourself a real GAS. 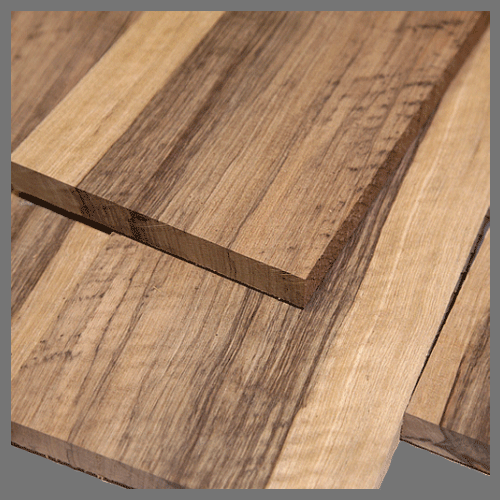 More commonly known as "Korina" wood, Black Limba is a medium weight tonewood that ranges between olive and tan in color. Usually with black and white streaking. The tone is very similar to mahogany but with the presence of increased mids, an excellent choice for players leaning towards the more warmer side than bright sounding. This custom P-09 build will consist of premium quarter sawn Black Limba back & sides paired with Limba body binding. The soundboard will resonate to the tone of Austrian Spruce (Moonwood) with matching bracing. A combination for the purists alike. To complete this limited P-09, our traditional Vine inlay will adorn the headstock. This P-09 Black Limba edition will be limited to 15 builds at $2603 MSRP each, all numbered sequentially and signed by Jean Larrivée. Completion date is set for mid January. Contact your dealer for availability. Over the next six months, UK distributor, Sound Technology, will be showcasing several hi profile professional Larrivée artists. First up is composer/instrumentalist/producer OWEN PARKER, and he is by far no stranger to the elite. From Annie Lennox to Robbie Williams to Simple Minds, Owen's talented hands have left and continue to leave their mark throughout the music industry. 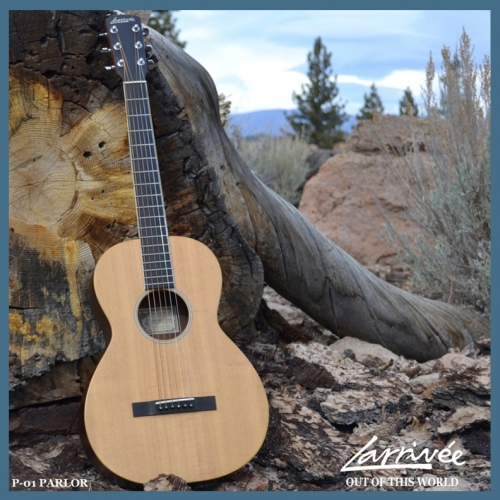 So it is no surprise that when it comes to acoustics, Owen chooses Larrivée. His LV-05E has been used all over the studio on countless hit producing albums and live performances, receiving praise everywhere he goes. 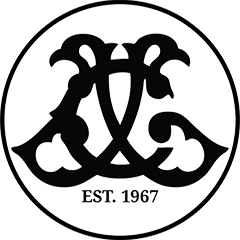 LARRIVÉE UK and Sound Technology are releasing the first video production in a series, which cast professional recording artists in a plain-speaking roles, extolling the fine sound and craftsmanship of Larrivée Guitars. P-01 REISSUE II & "SONGS FROM A TIN CAN"
OWN A PIECE OF MUSICAL HISTORY. ORDER YOUR LIMITED P-01 REISSUE MODEL TODAY.